To install your product on a wireless network, follow the instructions on the Start Here sheet and install the necessary software. The installer program guides you through network setup. Select Wi-Fi (Recommended) and press the OK button. 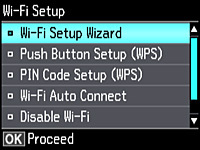 Select Wi-Fi Setup Wizard and press the OK button. Press the up or down arrow buttons to select the name of your wireless network and press the OK button. If you do not see your wireless network's name, you can enter it manually. Note: To enter the wireless network name manually, select Other Networks and press the OK button. Enter your network name as described in the next step. 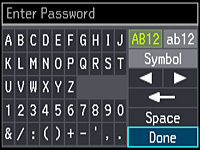 Enter your wireless password (or network name and then password). Press the OK button to confirm Wi-Fi settings. If you want to print a network status report, select Yes and press the OK button. (Otherwise, select No.) Your product should now be connected to the network. Note: If the Wi-Fi connection symbol does not appear on the LCD screen, you may have selected the wrong network name or entered the password incorrectly. Repeat these steps to try again.